Much was expected from a high-flying Manchester United, which was on an 11-match unbeaten streak, ahead of the PSG match but everything gradually fell apart for the home side as Solskjaer was given a brutal reality check by a rampant Parisian side. It should be noted that Thomas Tuchel's men were without their talismanic forwards Neymar and Edinson Cavani. Manchester United was completely outclassed in 2-0 defeat at Old Trafford by Paris Saint-Germain (PSG) in the first leg of their UEFA Champions League’s round of 16 match. In-form attackers Jesse Lingard and Anthony Martial limped out of the game while a red card to Paul Pogba further added to coach Ole Gunnar Solskjaer’s headache. On the other hand, PSG was almost unplayable for the Red Devils as former United winger Angel di Maria made all the difference by setting up Presnel Kimpembe and Kylian Mbappe. Much was expected from a high-flying Manchester United, which was on an 11-match unbeaten streak, ahead of the PSG match but everything gradually fell apart for the home side as Solskjaer was given a brutal reality check by a rampant Parisian side. It should be noted that Thomas Tuchel’s men were without their talismanic forwards Neymar and Edinson Cavani. After managing to keep PSG attackers at bay in the first half, Manchester United defence was torn apart by Angel di Maria. In a span of seven minutes, he chipped in a corner kick to Kimpembe who duly converted it and later he unleashed Mbappe for the second goal. United had already suffered injuries to Martial and Lingard, who might miss a lot of football action this month, Paul Pogba collected his second yellow card of the evening to make sure that he will not feature in the return leg of United’s round of 16 match against Paris Saint-Germain. 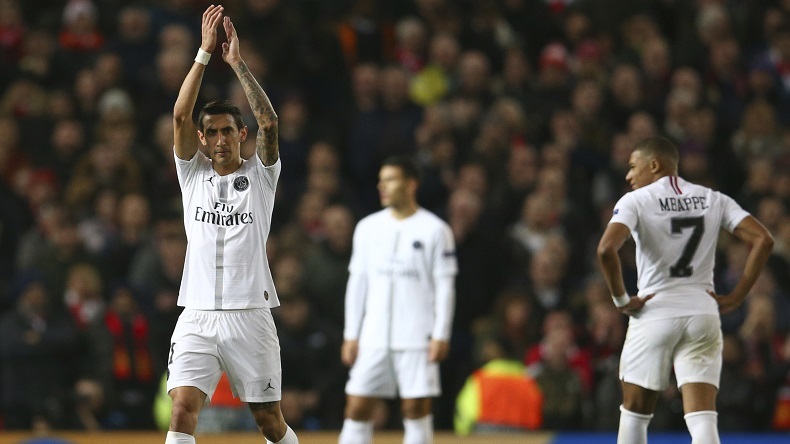 The Red Devils will now travel to Parc des Princes on March 6, Wednesday, to play the second leg of the match. And it will be a monumental task for them to overturn the first leg deficit, especially without Paul Pogba.